Sunday … what a day! The weather has finally started to cool down here, we have gone from 38 – 40 degrees to 32- 36 degrees which let me tell you, makes a huge difference. However for Sunday’s excursion it would have been better if the temperature had been in the 20’s but hey nothing we can do about that! 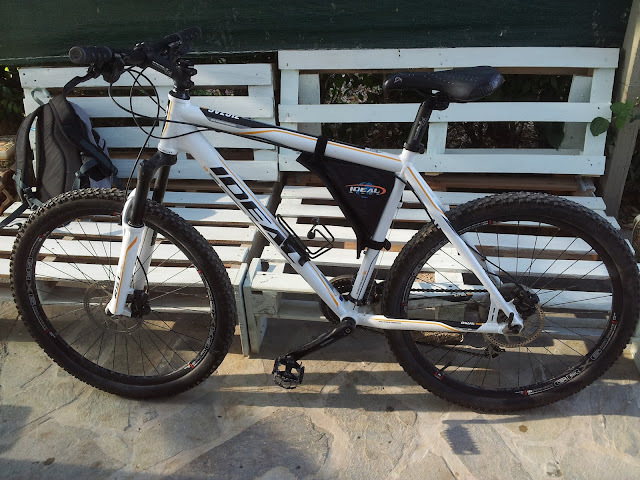 For my husband’s birthday the year we moved to Crete he was given a mountain bike – the idea being that it would replace the off road driving we used to do with off road cycling – I very cheekily purchased one at the same time… well it was something we should do together anyway! My husband’s relationship with his bike has been a serious case of love hate. Some days there is more love than hate, other days a lot more hate than love … it took him a while to get into it. In fact, the first year I think it had about 8 outings - the rest of the time it has very industrially decorated the wall under the stairs. This year it would seem that love is in the air! At the beginning of the year, aided somewhat by our house move, the bike went from being a wall ornament to a bike which was actually used, he got all enthusiastic about it and even went out and wait for it … yep you guessed it … he went out and bought another GPS … this one of course was a hand held one which he could mount on the bike. This GPS and his previously mentioned love for Google earth has brought his enthusiasm up 100 fold. So when Sunday came around he was ready for it … the route had been meticulously planned. We had our water, bananas, gator aid, emergency medical equipment and even my trusty camera - we were ready, so we thought! His bike - Note the GPS mounted to the handle bars! The route was to be 30kms, it would be a loop from our house up a mountain, down the other side, up another one and then down the road home. Easy as pie, yeah right. The beginning was ok, we climbed a winding road that would take us past the village of Achladia and on to Paraspori – this section I knew quite well as at the beginning of the year I had been getting up early in the morning to get a ride in before work. Note: at the beginning of the year! The summer had arrived and along with it the heat and constant high wind speed - the bike was retired to its house and my cycling legs had gone into hibernation. I have only taken the bike out three times since it started to cool down and well, that’s not really enough for the route we were on! Anyway, determined to get on with it, off we went. The road is generally quiet but we were overtaken by a few farmers who looked at us and seemingly wondered what on earth was wrong with us. To them I am sure that we were what they considered crazy foreigners! The truth is that we were. Eventually we made it to Paraspori where the down hill started … It was lovely to coast for a while after climbing up a mountain for an hour, it was great to ride without huffing and puffing like a steam train. The downhill of course could not last for ever and with a heavy thud we were very sharply brought back down to reality as the track went into a horrific incline. Climbing up the second mountain was hard … almost so hard that it took the enjoyment out of it. It made me make a mental note to remember to eat breakfast, as I struggled up the mountain. Eventually after a fair number of rest stops and quite a few wheelies – it’s very hard to keep the front wheel on the track when you’re climbing almost vertically - we made it to the road. I have NEVER been so happy to see black top in my life. The ride from the end of the track home was fast and the majority of it was downhill. 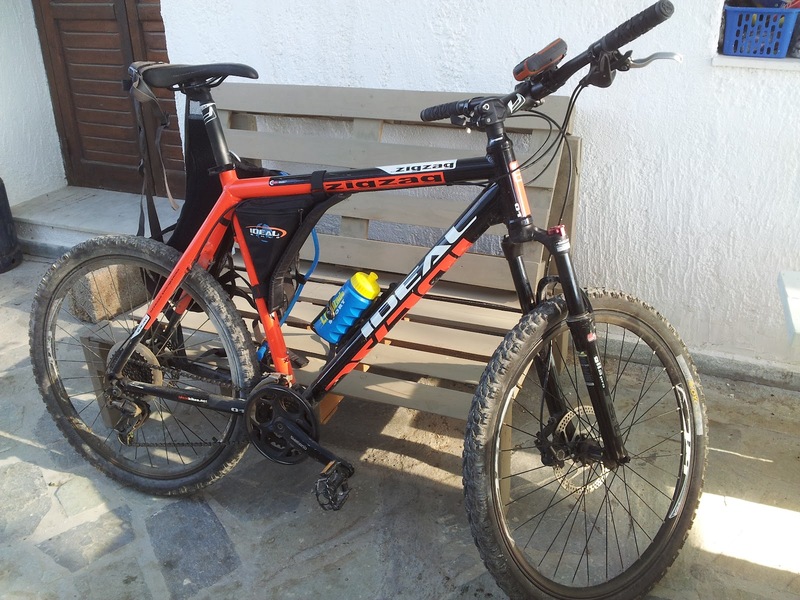 In total we cycled 30kms during which we gained 1000m in altitude. We managed it in three hours, which given the fact that both of us are pretty unfit I thought - was a fairly good effort. 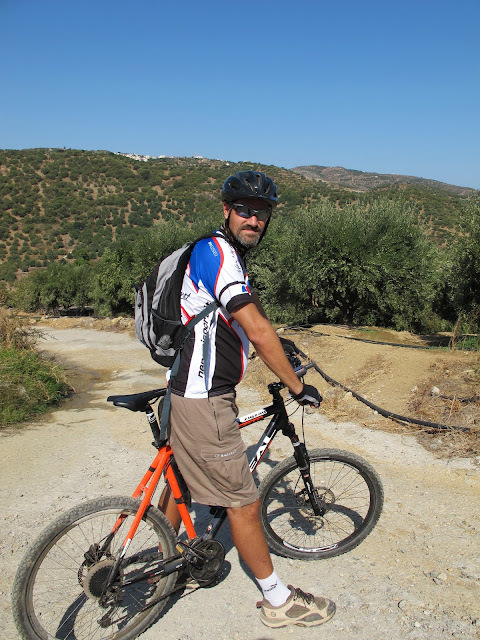 If your are a mountain biker I can’t recommend Crete enough, there are just so many tracks to go up and down with every kind of terrain you can imagine. Plenty of climbs and given that what goes up must come down there is some pretty wicked downhill riding to be done too. This particular ride is detailed below along with all the inclines!! Unfortunately I didn’t really take too many pictures as when your trying to make it up the mountain the last thing on your mind is a picture or two! My husband uses Wikiloc to record all his routes you can you can have a look at the route from Sunday here.